The power of evaluative thinking. Dr. Jane Davidson and educational systems change expert Joanne McEachen explain how sometimes the obvious solution is not in fact the right solution at all. Even if it’s part of what’s needed, there are systemic issues in play that must be addressed as well. There have been two major changes in evaluation in the past decade, and a new book just out this week combines the two in an amazingly rich and thoughtful, but practical and readable way. 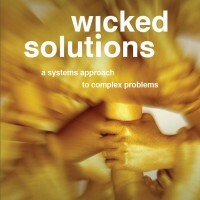 It’s Bob Williams and Sjon van ’t Hof’s Wicked Solutions : A systems approach to complex problems.